I unashamedly promote the Perth Swan River Community Markets on this Fremantle blog as market organiser and my boss Kylie Wheatley and I are both from Freo, so a bit of self promotion should be alright. The market is straight behind the Belltower and open each Saturday from 8 am to 1 pm with food stalls, art, craft, fresh produce, etc. There is live music, fairies, face painting and an animal farm for the kids, and it is a nice space to spend a Saturday morning. This weekend also sees the Deepavali Festival of Lights in the Supreme Court Gardens just over the road, so perfect to combine the two events and hop on the train from Freo to Perth for an adventure in the big smoke. Since I am involved with the SWAN RIVER COMMUNITY MARKETS at the Perth Belltower I am going to promote it now and then here on Freo’s View in the hope to entice some of my readers to make the epic journey across the mighty Swan into the big smoke. The markets is on again tomorrow from 8 am till 1 pm and there is also the inaugural Bonjour French festival in Langley Park, so you could combine both events and make it a day out. It will also give you the opportunity to check out the quite spectacular Elizabeth Quay development! Take the train from the Murdoch train station to the Esplanade or from the Fremantle train station to Perth, or for the more adventurous drive to South Perth and hop on the ferry to Barrack Street. It will be fun! We do markets well in Fremantle, even when we do them in Perth. 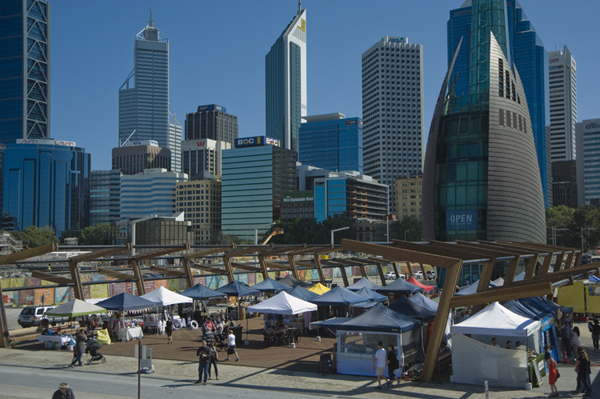 Freo’s Red Tent Events owner Kylie Wheatley, who also manages the Growers Green Farmers Markets in Beaconsfield, was contracted by the Metropolitan Redevelopment Authority to create the SWAN RIVER COMMUNITY MARKETS at Barrack Street on Elizabeth Quay. The market is wedged between the Swan River ferry terminal and the Belltower and is rather special in that location. It has food stalls, fresh produce, arts and crafts, an animal touch farm, live music, Fairy Sandie and live music. Leave your car at Murdoch and hop on the train to the Esplanade Station. The market is on on Saturdays from 8.30 am to 1 pm.